Many Deaf people experience mental health concerns including high levels of anxiety and depression due to feelings of isolation. Empirical research suggests the practices of yoga can assist in the treatment of depression, anxiety, stress, trauma and sleeping difficulties yet it’s not a practice generally accessible to Deaf people. We can all imagine how isolating and frustrating it must be to have health advice, support group engagements and activities in a language you can't access, let alone trying to find accessible ways to basic information and communication. Whilst this is a daily reality to navigate for those who are Deaf or hard of hearing, we want to provide avenues to create more opportunities for this population to connect with themselves and with others. What can the practice provide for the Deaf? 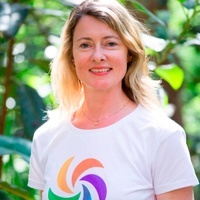 The practice uses physical stretches, breathing techniques, relaxation, meditation as well as psychological, ethical and spiritual teachings for the promotion of wellbeing. It’s a holistic mental health intervention that can be adapted person to person. Many of the relaxation, breathing and meditation practices taught in yoga are very similar to those used in evidence-based psychotherapies, including cognitive-behavioural therapy. Yoga therefore represents a cost-effective self-help strategy for teaching people the skills improve their health and emotional regulation skills. Yoga is not easily accessible to all. There are just a handful of Deaf yoga teachers in Australia and hardly any hearing teachers who use Auslan. This precludes Deaf people from participating in an activity with many proven health benefits and we don't think that's fair. all designed specifically to meet the needs of Deaf people, with a focus on mental health. The Yoga Foundation is working closely with Deaf Yoga teacher and clinical counsellor Karli Dettman and her team at the Karli Health Centre. We are also in touch with the Deaf Society of NSW, the Royal Institute for Deaf Blind Children and Signpedia to ensure we reach people in need. We want to raise $5000 to enable to delivery of weekend retreats, one day workshops, an 8 week yoga program and online content. We can reach and support 100s of Deaf people nationally via these program formats! If we can use these programs to demonstrate the positive changes Auslan yoga classes can bring to Deaf people’s wellbeing we believe we’ll be able to promote a much broader, sustainable ripple effect in this important space. Make Yoga in Auslan accessible to Deaf people experiencing disadvantage, depression and anxiety.